We spent a fantastic day at The Red Cross Christmas Gift Fair last Monday. 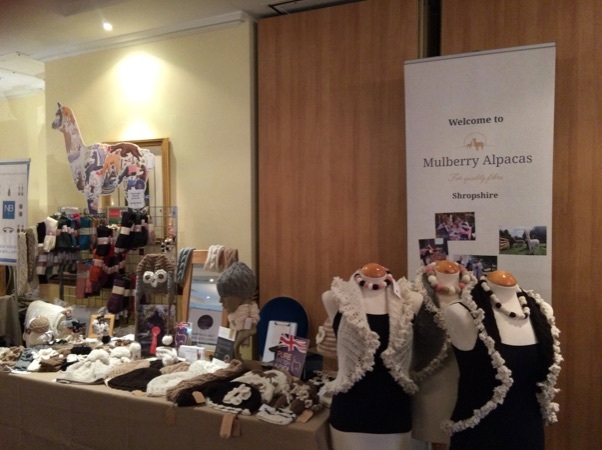 It’s always lovely to meet many friends old and new and to see such a lot of interest in those extra special gifts made from luxurious alpaca fibre that we are able to show. We are very proud of our products. We also know that or socks – although not made from fibre from our own herd are made by John Arbon in North Devon from carefully selected UK alpaca and are the very best that that we can source. Over the next few weeks we will look forward to our Christmas Shopping Saturdays at Mulberry Alpacas where there’ll be that atmosphere of Mulled Wine and Mince pies and an opportunity to see our lovely herd. (Inca Grampian just loves receiving visitors and has become a total star in every respect!). We’ve got lots of different designs in our shop especially for this build up to the Christmas Season. Do pop in for some Mulled Wine and a Mince Pie and see all our lovely goodies.